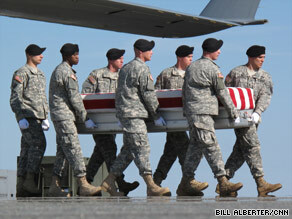 Bodies of soldiers killed in Afghanistan back in U.S.
(CNN) -- The flag-draped coffins of five U.S. soldiers killed during a weekend onslaught against a U.S. military outpost in Afghanistan arrived Tuesday at Dover Air Force Base in Delaware, the military said. A flag-draped coffin is carried off a plane Tuesday at Dover Air Force Base in Delaware. The bodies include Sgt. Joshua J. Kirk of South Portland, Maine; Spc. Michael P. Scusa of Villas, New Jersey; Spc. Stephen L. Mace of Lovettsville, Virginia; Spc. Christopher T. Griffin of Kincheloe, Michigan; and Pfc. Kevin C. Thomson of Reno, Nevada, according to the Air Force mortuary affairs office. Coverage of the troops' return is allowed with the permission of their families under a policy the Obama administration instituted this year. At least 13 Afghan police officers also were captured in Saturday's attack, according to Haji Abdul Halim, the provincial deputy governor. Meanwhile, security forces hunting down the attackers have killed a few dozen insurgents in raids, an Afghan official said Tuesday. Afghan Defense Ministry spokesman Gen. Mohammed Zahir Azimi said the operations were in the Kamdesh District of Nuristan province. He cited around 100 insurgent casualties, including 35 to 45 deaths. Azimi said there were no Afghanistan army casualties. NATO's International Security Assistance Force on Tuesday said more than 100 "enemy forces" were killed during the fighting Saturday, which were "significantly higher losses than originally thought." The NATO-led force believes the attack on U.S. and Afghan troops was conducted by "local anti-Afghan forces, while local Taliban and elements of Hezb-e Islami Gulbuddin may have helped facilitate the attack." The group responsible for conducting the attack was initially reported as "Nuristani tribal militia," the ISAF said. In the past 24 hours, 10 Afghan soldiers were killed in incidents across the country, Azimi said. Britain's Defense Ministry said a British soldier was killed Monday while on foot patrol in Helmand province. The first week of October has been a deadly one for coalition troops in Afghanistan, with 16 U.S. deaths and now two from Britain. CNN's Atia Abawi and journalist Matiullah Mati contributed to this report.